I've been meaning to write about Norman MacCaig for a while, and as the BBC is having a poetry season this seems like a good moment. MacCaig is second from the left on the book cover. Worlds was edited by Geoffrey Summerfield who also produced the excellent Voices series, of which more in another post. 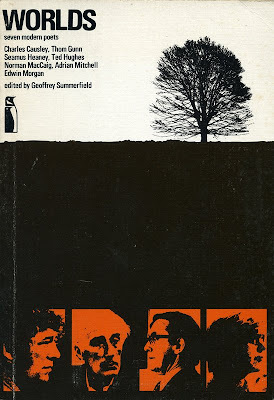 The book contains interviews with seven poets: Charles Causley, Thom Gunn, Seamus Heaney, Ted Hughes, Norman MacCaig, Adrian Mitchell and Edwin Morgan. It also has photo essays on each poet by Fay Godwin, Larry Herman and Peter Abramowitsch. I first came across Norman MacCaig in the late 1980s when I heard him being interviewed on the radio. He also read some poems about frogs. I went out and bought his Collected Poems and read it from beginning to end - not a thing I usually do with poetry books. as in the long ago, as in forever. MacCaig spent a lot of time in Sutherland, in north-west Scotland, and had a special relationship with the strangely-shaped mountain, Suilven, that rises from the watery moors behind Lochinver. I recommend that you go and climb the mountain from Inverkirkaig, where you'll see the moving monument which the Friends of Norman MacCaig have erected at the start of the path. You'll also have a wonderful day out, if the midges aren't biting and the weather is fine. Norman MacCaig died in 1996. The Poems of Norman MacCaig edited by his son Ewen comes with a CD of him reading his poems. For a very different outdoor poem also linked to this BBC stuff visit Chris Priestley's blog. It's all connected, you know! I finished a book today. Well, I say finished - I wrote the final chapter and now all I have to do is rewrite it a few times. It's not a very long book and it's taken me a ridiculously long time to write. My new plan is to write a long book very quickly!